CANEY, Ks. (June 30, 2018) – Alex Sewell outran both the rain and the competition to win his first Ameri-flex Hose and Accessories / OCRS feature of the season Saturday night at Caney Valley Speedway. 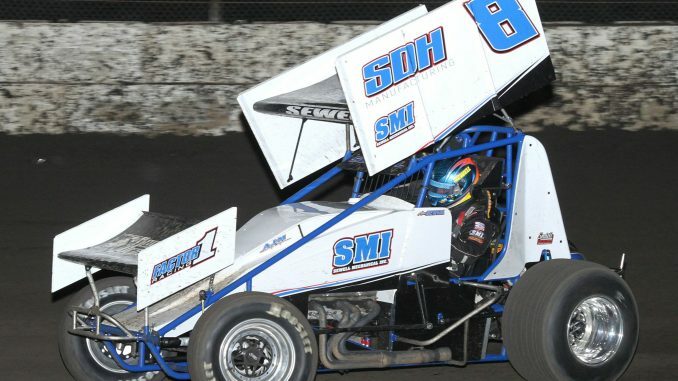 Sewell, who picked up his fifth OCRS career feature win, became the sixth different winner of the 2018 season. What started as a hot 93 degree day soon became a balmy 83 degrees as unexpected storms moved toward the Caney area as race time approached. The rain stayed away long enough to get heat races run, which were won by Andrew Deal and Sheldon Barksdale, then a brief shower soaked the quarter-mile oval. The track was re-packed and racing resumed. Sewell started outside front row in his Action Auto Collision, DSO Racing Engines, Sewell Mechanical, ART sprinter and took advantage of a very fast and tacky race track to shoot past pole sitter Johnny Kent for the early lead. Sewell set a blistering pace clocking a fast lap of 12.871 on his third lap around the quarter-mile oval to top all competitors. Kent gave chase throughout the 20 laps but could not mount a challenge and finished 0.925 seconds behind Sewell at the finish. Defending champion Zach Chappell was holding down third when he tangled with Mickey Walker and crashed into the front stretch wall to bring out the yellow. Walker restarted in third but came to a stop on the backstretch on lap 10 bringing out the nights second yellow. Walker could not continue and Casey Wills moved into the show position. On lap 14, Wills, who was having one of his best runs of the season, would bounce to a hard stop in turn four to bring out another yellow and this would allow Sheldon Barksdale to inherit the third place position as Wills was towed pitside. Misfortune struck again several laps later and the red flag would wave for a crash involving Andrew Deal, Joe Bob Lee and Shayla Waddell. Deal had trouble upon exiting turn four and slowed dramatically in front of Lee and Waddell causing Lee to slam into the rear of Deal and went flipping on the front straight. Waddell hit the aforementioned cars and stopped on the track as well with her front nose wing knocked askew. Thankfully nobody was injured and Waddell was the only driver able to restart the race. Sewell kept Kent and Barksdale in check over the remaining laps to close out the win. Matt Sherrell and Layne Himebaugh finished in the fourth and fifth positions. Waddell earned the York Plumbing Hard Charger award with a sixth-place finish after starting 13th. Joe Bob Lee picked up the M&W Aluminum Hard Luck Award. 1, 15D-Andrew Deal. 2, 8-Alex Sewell. 3, 31-Casey Wills. 4, 55-Johnny Kent. 5, 94L-Layne Himebaugh. 6, 5L-Joe Bob Lee. 7, 76S-Shayla Waddell. 1, 20S-Sheldon Barksdale. 2, 50Z-Zach Chappell. 3, 2-Mickey Walker. 4, 22X-Matt Sherrell. 5, P78-Perry Pickard. 6, 22T-Frank Taft. DNS: 007-Michael Bookout. 1, 8-Alex Sewell. 2, 55-Johnny Kent. 3, 20S-Sheldon Barksdale. 4, 22X-Matt Sherrell. 5, 94L-Layne Himebaugh. 6, 76S-Shayla Waddell. 7, 22T-Frank Taft. 8, 15D-Andrew Deal. 9, 5L-Joe Bob Lee. 10, 31-Casey Wills. 11, 2-Mickey Walker. 12, 50Z-Zach Chappell. 13, P78-Perry Pickard. DNS: 007-Michael Bookout. Lap Leaders: Alex Sewell 1-20. Margin of victory: 0.925 seconds.